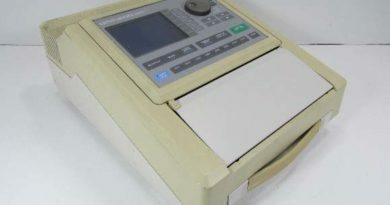 The resonant – reed frequency meter is one of the more simple and ragged frequency measuring instruments in use. The indication of this instrument depends upon the mechanical resonance of thin flat steel reeds. When reeds are placed in the magnetic field, different reeds vibrate at different frequencies. This type of meter consists of a series of thin metal reeds of equal length usually of 4 mm wide and 0.5 mm thick. But slightly different weights are attached to one end of the reeds. This added weights made each reed mechanically resonant at a particular frequency. This unweighted ends are attached to a common base plate. Now the reed and base plate assymbly is mounted in the field of an electromagnetic coil. The weighted ends of the reeds are visible through a narrow window in the face of the meter housing and are painted white. The given alternating current to be measured, such as the 60Hz power line frequency, is passed through the coil. 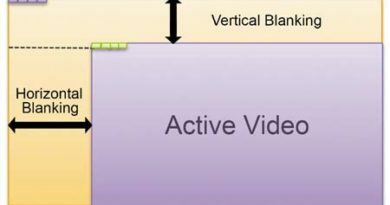 The base plate vibrate at the frequency of the applied current. The reed timed to resonant frequency will vibrate with large amplitude. (i) If the driving frequency is midway between the frequency of two adjacent reeds, both reeds vibrate at an equal but reduced amplitude. (ii) If the coil frequency is between two adjacent reeds but not midway, both reeds vibrate, but the reed closest to the driving frequency vibrates with the greater amplitude. 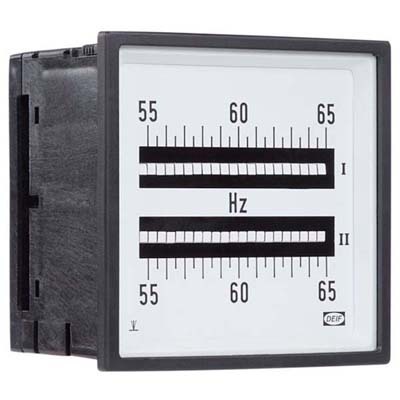 Range of the limits imposed by mechanical inertia, these meters are limited to power-line frequencies, usually either 50 or 60 Hz. As a result, the resonant-reed device normally has a range limited to a few cycles either side of a nominal centre frequency. It gives an accuracy of about + 0.3%. 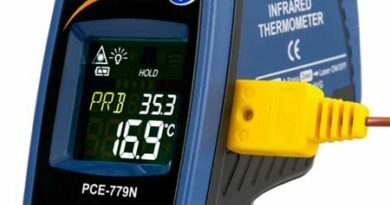 Vibrating-reed frequency meters are usually panel mounted. Their greatest use is with portable engine driven generators (alternators), enabling the operator to correctly set the speed. 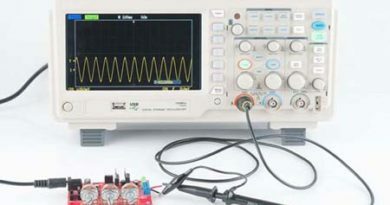 (i) Its indicators are independent of the waveform of the applied voltage. (ii) Its indicators are also independent of the magnitude of the applied voltage but voltage should be high enough to provide sufficient amplitude for reed vibration so as to make its reading reliable. (i) It cannot read closer than half the frequency difference between adjacent reeds. (ii) Its error is dependent upon the accuracy with which reeds can be tuned to a given frequency.